How do I attach a debugger as soon as a process is started? As a service’s process is started by “services.exe“, which is a vital process for Windows, we have to do a little trick to tell the OS: “always starts this executable with a debugger attached”. Of course we could attach WinDbg to “services.exe”, and tell him to debug also created child processes. Besides the fact that we will debug all other processes launched by it, there is a big drawback with this method: Windows does not really like when you’re messing with a vital process (I already had blue screens while trying to do that…), and your OS session can be ruined if you make just a simple mistake. I warned you. 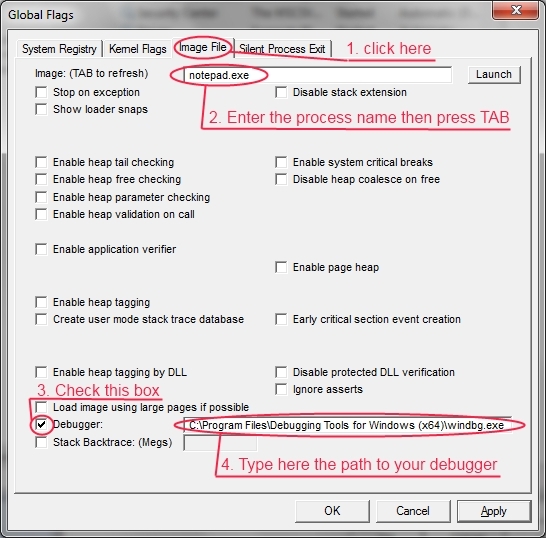 I know a much better trick: just start the utility “GFlags.exe” available in the “Debugging Tools for Windows” package. It is a simple tool with a lot of nice features (some are a little bit complex to understand, see here for a detailed documentation) including the ability to force the operating system to attach a debugger at the very beginning of a given process. I choose here to use WinDbg to debug all instances of “notepad.exe” created. You can test it now : start notepad the way you want and you should see WinDbg pop-up. Nice isn’t it? you will find a string value named “Debugger” : just delete it and you’re back to a regular process launch. Now I know how to attach a debugger as soon as a process start, but I can’t see my debugger when I use this trick on a service. Enter anything you want for <my debug session> (just make sure to enter different things for each debugging session you are doing on the same computer). You can also use a different transport than pipes to communicate, but this choice is very fast and easy. As you can see I named my debug session “DebugSQLServer” but you can choose anything instead (did I already told this?). The start of the string typed in the debugger check box is not visible, but it is the end that matters. You can now try start the selected service; you should see a “cdb.exe” instance running (use the task manager, or even better ProcessExplorer). And how do I connect to this invisible cdb.exe? 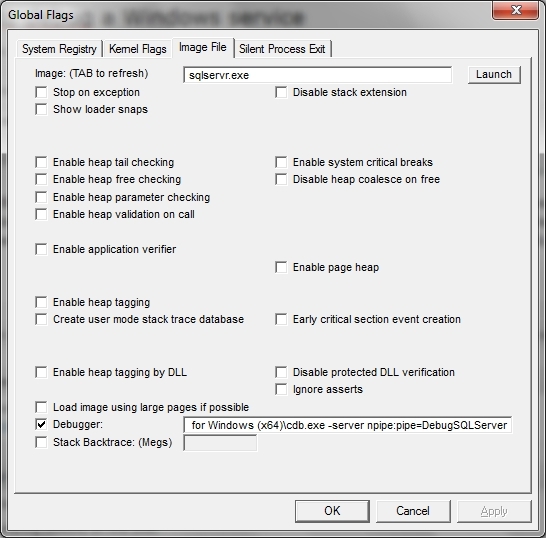 By using any debugger from the Debugging Tools for Windows package, including “Cdb.exe” or “WinDbg.exe“. My choice would be to use the second one (well, a little bit of graphical stuff is not bad) and connect to the session by using the menu “File -> Connect to remote session…” and enter “npipe:server=localhost,pipe=<my debug session>” in the message box. As you can see you can also connecting to another computer if you change “localhost” by the name of the distant one. That’s cool! But after a few moments, the service controller starts complaining about timeouts and stop my process! and typing a new DWORD key value named “ServicesPipeTimeout” and setting its value to the amount of milliseconds the system should wait before entering in timeout state for each command send to the service. 300000 (5 minutes) should be sufficient for short debug sessions, but you can basically enter any number you need. Just beware that there is a unique value for every service of your system! By changing it, you also change the behavior of all other services. It’s almost finished: you just have to…reboot, as the Service Control Manager reads this value only at startup :(. And don’t forget to put it back to its former value (or delete it) next time!